Snow Retention Systems (Snow Guards) are devices that are attached to the roof structure in order to provide uniform retention and control the snow from avalanching in large sheets. They need to be applied in sufficient quantity according to a prescribed pattern in order to be effective. Why do you need snow retention systems on your roof? Don’t put yourself at risk! Retention Systems help prevent damage to objects below a sloped roof surface including, pedestrian areas, parked &moving vehicles, expensive landscaping, gutters & plumbing vents, skylights & atriums, adjacent and lower roofs. Snow Guards help to avoid costly insurance claims due to avalanching snow and ice. They also help to prevent ice damming at roof’s edge and damage to gutters. It is extremely important to install a proper and sizable quantity of guards in order for the retention system to be effective. Berger Brothers will provide a custom snow guard layout recommendation. Contact 800-523-8852 for your custom layout. 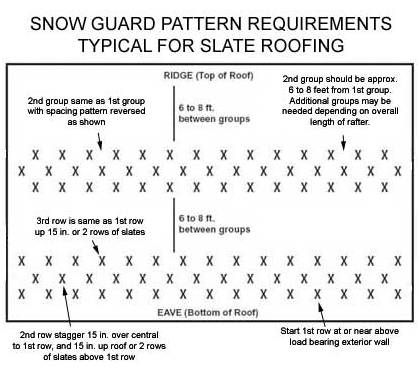 Patterns provided by Berger are only recommendations and actual snow guard patterns should be approved by a licensed architect.